WITH dwindling natural gas and oil reserves, the world is increasingly looking for alternative sources of energy. Industry people say shale gas is one promising option. It is the natural gas trapped in shale, a type of flaky sedimentary rock. It already accounts for 22 per cent of USA’s gas supply. By the US energy information administration’s reckoning, shale gas will meet 14 per cent of the world’s gas needs by 2030. Environmentalists are sceptic of this option, primarily because of its controversial extraction process. 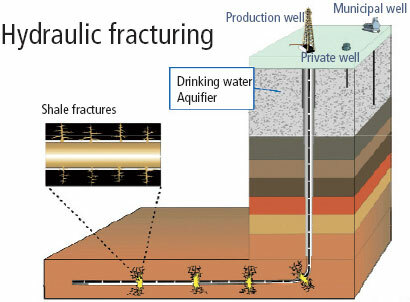 Called hydraulic fracturing or fracking, the process involves injecting a mix of water, sand and chemicals deep underground at ferocious pressure. This breaks up shale formations, releasing the gas trapped so it can be pumped to the surface. The technology so far remains almost unregulated as there was no evidence to show its environmental impact. A recent study by geologists at Duke University in the US found that groundwater near shale extraction sites in the country is contaminated with methane. They collected water samples from 68 wells in five counties in Pennsylvania and New York. The region overlies the Marcellus and Utica shale formation, the largest known gas reserve in the US. Residents have been complaining of well water contamination since drilling started in 2005. Though there has been little research on the health effects of methane in drinking water, the inflammable gas can cause respiratory problems like asphyxia. There are reports of houses near extraction sites being blown up due to methane leak in the basement. Tests revealed water in wells within one kilometre of the extraction sites had 17 times more methane than those farther off. The samples contained 19.2-64 mg of methane per litre. This is a potential explosion hazard, the scientists noted in the Proceedings of the National Academy of Sciences on May 9. The team led by Robert Jackson also used carbon and hydrogen isotope tracers to distinguish between thermogenic methane, formed at high temperatures deep underground and captured in gas wells during fracking, and biogenic methane, produced naturally at shallower depths and lower temperatures. Analysis showed water in wells within a kilometre of extraction sites contained the methane released during shale gas extraction. “We do not know the mechanism for methane contamination. It could have leaked through the well casing,” says Avner Venghosh, co-author of the study. The paper mentions that the contamination could also be due to new fractures formed during fracking. The study’s publication coincides with the French government’s decision to ban fracking for the exploration and production of shale gas and oil in the country. 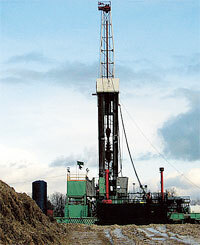 Opponents of the technique say shale gas is not as clean as the industry claims. In a study paper published in Climate Change Letters in April, Robert Howarth from Cornell University in the US says shale gas has a greater carbon footprint than fossil fuels over a long period (see ‘Gas with heavy footprint’). Besides, fracking requires a lot of water and uses toxic chemicals. Though oil and gas companies are often reluctant to disclose the chemicals they use, critics say over 750 chemicals are used in the process. Pennsylvania’s environmental protection department recently released a list of chemicals used in fracking at the Marcellus shale wells. One of the chemicals, xylene, is neurotoxic and can damage liver. Another chemical, methanol, causes cancer. The Duke scientists, though, say they did not find evidence of pollution from the chemicals. Partha Chakraborty, professor of geology, University of Delhi, remains sceptical of their conclusion. If the extraction procedure is faulty, it is likely that the chemicals would remain trapped in the strata, he says. These chemicals can flow into the surrounding environment in events of well spills and accidents. Oil companies claim they handle the chemicals safely. The state-owned Oil and Natural Gas Corporation (ONGC)Ã”Ã‡Ãªin January announced the discovery of India’s first shale gas reserve in Durgapur in West Bengal. Cambay, Krishna Godavari and Kaveri basins also have potential shale reserves, it says. The government plans to auction these blocks for exploration by the end of the year. Though it might be long before the reserves can be exploited commercially, it provides an alternative to a country which shells out a fortune to import natural gas. According to the Petroleum Planning and Analysis Cell, India’s crude oil imports were worth US $7.15 billion in December 2010—a month-on-month rise of 17 per cent. Energy experts like Bhamy Shenoy from Mysore, former board member of Georgian National Oil Company, say shale gas is a promising option for India given its scarce energy resources. A report by non-profit Prayas Energy Group in December last year warns that all potential shale gas sites in the country are water scarce. It cites western Rajasthan as one such area. The non-profit recently wrote a letter to the Ministry of Petroleum and Natural Gas, urging the government to undertake research to explore the link between fracking, groundwater resources and land subsidence before auctioning the the shale blocks. Since fracking is the main problem associated with shale gas production, the industry can ensure proper casing of shale gas wells to avoid methane leakage, Chakraborty suggests. What is USA’s view on shale gas? There is still a lot of debate going on in the US. Some say shale formations are so deep that fracking cannot contaminate groundwater. A large body of evidence, on the other hand, suggests that water contamination is occurring. There seems to be a large amount of leakage into the casing of shale wells, and, of course, accidents and spills happen. Greenhouse gas emissions from fracking is so high that this may aggravate global warming. What’s government’s response to the controversy? The Congress in 2005 passed a law that exempted fracking from the federal regulation, leaving it to the individual 50 states. Since the states are not experienced in dealing with large-scale environmental regulation, some are doing a better job than the others. Pennsylvania, for instance, has been overwhelmed in trying to deal with the problems. It underestimated the seriousness when drilling started. The problems have become apparent in the last two years. New York has not allowed fracking. It is still studying the process. What is the status of fracking in other countries? Fracking is a new technology. It has been done in the past 12 years, and mostly in the past three-four years, first in Texas and Colorado, and recently in northeastern US. Our government and industry are eager to export this technology. President Barack Obama recently signed an bilateral agreement with India in this regard. Industry wants to use the technology in South Africa and Australia. Efforts are on to explore reserves in France, Poland, Germany and Russia. How do these countries react to the plan? As far as I know, Canada is the only country outside the US where significant drilling is being done for shale gas. It has started experiencing the same problems as in Pennsylvania. The province of Quebec has put a temporary ban on fracking. In Europe, there were protests in Paris against this technology. Following similar opposition in South Africa, where they are planning to use the technology in arid areas, the government has put a temporary ban. Australia is slowly adopting the technology. What could be the impact of shale gas in India? I would be terribly concerned about the impact of shale gas in India with the large quantities of water needed and the resultant water pollution. The wastewater is contaminated with radioactivity and toxic substances. The US is doing a terrible job of handling it. Officials put it in municipal sewage treatment plants, which are not equipped to handle this kind of waste, and it flows into rivers and streams. 2011 Pulitzer Prize Winning Pro Publica has done over 100 stories on shale gas drilling - fracking in recent times, which are worth considering. On the other hand, as environment issues have been raised in the US, ex-Homeland Security head Tom Ridge has been working as a lobbyist for the industry. Our own companies have joined the game in the US, and given our own energy mismanagement and hunger we will hear a lot more about fracking in the coming years. Ear to the ground Dinsa. Good job. We couldn't use the bit about Reliance's explorations in Marcellus Shale, because it's still early days for them - and also because of a lack of space in the magazine!